On my first visit to India for a world diversity conference in 1997, I made friends with Marisa, an Indian woman who lived in Mumbai. Though she was Catholic, she was quite comfortable in the Hindu culture surrounding her. While sightseeing in the city, she took me to a temple that, if it wasn’t actually ancient, was in enough disrepair to qualify it as such. We took our shoes off at the designated place in the outer courtyard. Like many entrances to Hindu temples, there was a statue out front. 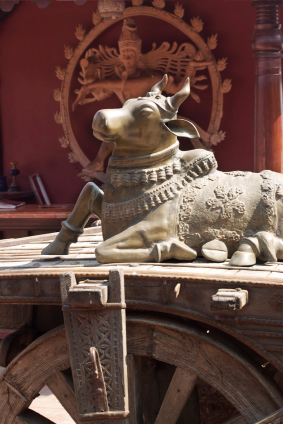 It was a bronze cow or bull, (I wasn’t sure), that had been worn shiny by countless hands touching it in reverence before entering the inner sanctum. Suspended over it was a bell. “Come, let’s ring the bell, and let the gods know we are here,” she smiled, beckoning me to follow her example. 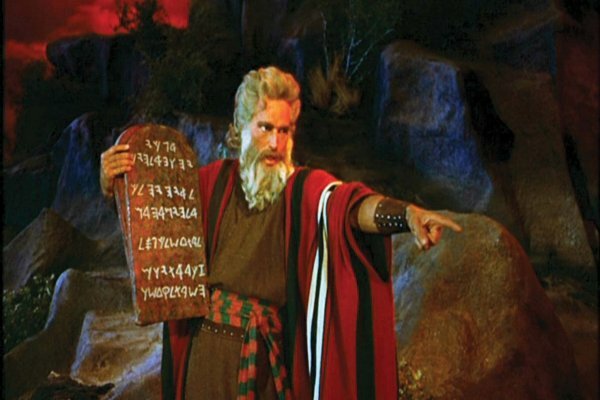 Despite my multi-cultural self, all my Jewish upbringing arose, and I couldn’t bring myself to touch that golden calf…er…cow…er…bull. (I did, however, follow Marisa into the temple). Such is the power of cultural implants. Judaism and Islam share something in common in this area: one is not supposed to make “graven images,” or represent God in any physical way. 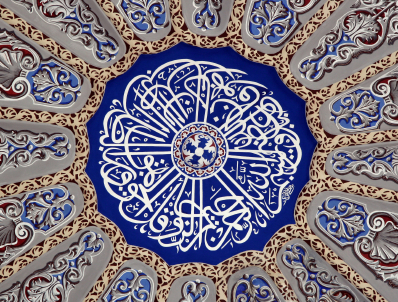 Art will express itself somehow, and from this proscription, you get the absolutely stunning Islamic calligraphy and decorative arts. (I think Jews were too busy being chased out of various countries around the world to develop a parallel artistic accomplishment on the same scale). The point is, one didn’t paint pictures of God. Someone failed to tell that to Michelangelo, however, and to countless other Christian artists before and after him. As we all know, the Catholic and Orthodox churches developed a sophisticated vocabulary of imagery precisely focused on statues and icons, thus giving us some of the greatest works of art in the Western world—which, as an art student all my young life, I imbibed with my milk and cookies (and later wine and cheese). Yet, like many outside that culture, worship that included images or even more disconcerting, statues, was beyond my understanding. Soul work, or inner work, takes place when something moves from the unconscious, where it began, into conscious awareness. The path is never straight and neat inside oneself, as if you could go to a library and do all your inner work there. Instead, when something is ready to move from the unconscious to the conscious, it needs a host or intermediary. Generally this intermediary is some person or thing. In other words, a saint, guru, picture or statue. Spiritually speaking, we need to project those divine qualities that are our birthright, that we carry within us, onto someone or something else. Seen in a magnified way in another, it become easier for us to grow into those holy qualities, be they goodness, kindness or holiness itself. Indian tradition takes that a step further—a student literally worships the guru as God, with the understanding that the Guru is in fact a stand-in until the student can hold that Divine energy him/herself. 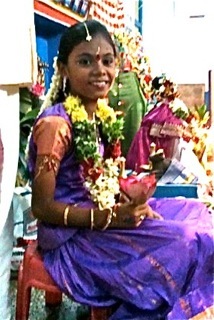 I attended a ritual in the city of Madurai on my last trip in 2009. At the end of the nine-day Dassera festival came an evening devoted to the women. 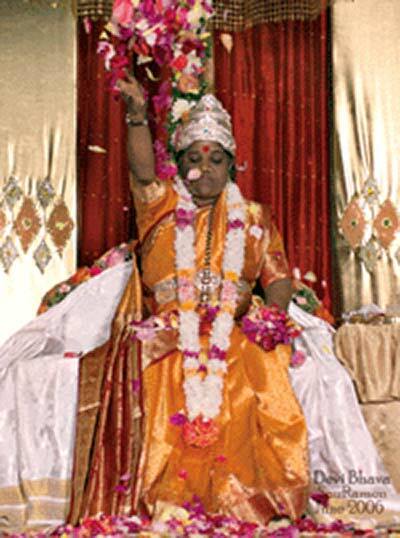 As part of that holiday’s ritual, a young girl was dressed up as a goddess Parvati, and the older women fed and tended to her in a worshipful manner. 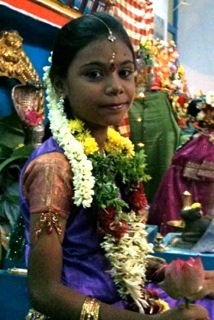 The beautiful girl accepting the devotions of her elders was graceful and stunning. At the core of the ceremony was yet another variant of that all-encompassing Sanskrit greeting: Namaste: the God in me beholds the God in you. 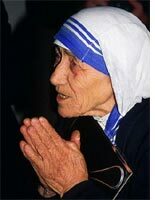 When Mother Theresa was asked how she could embrace the most destitute and dying on the streets of Kolkata, she answered that when she looked at them, she saw Jesus. This, too, is the projection of the Divine. If we see the Divine outside ourselves enough, eventually we bring it home where it belongs, in the inner temple. Where are your divine projections focused? Where do you think they come from? (People of different backgrounds see that divine seed differently.) How do you remember the sacred? This entry was posted in Divinity, Memoir, Spirituality, Stories from the Journey and tagged Divine, God, goddesss, India, Namaste, Projection. And in the movie AVATAR… “I see YOU”.